*Disclosure: This is a sponsored post written by me on behalf of Frontier Communications. All thoughts and opinions, as always, are my own. Which Underwood is he referring to? I’ve been a music fan my entire life but I’ve never been to a country music show. 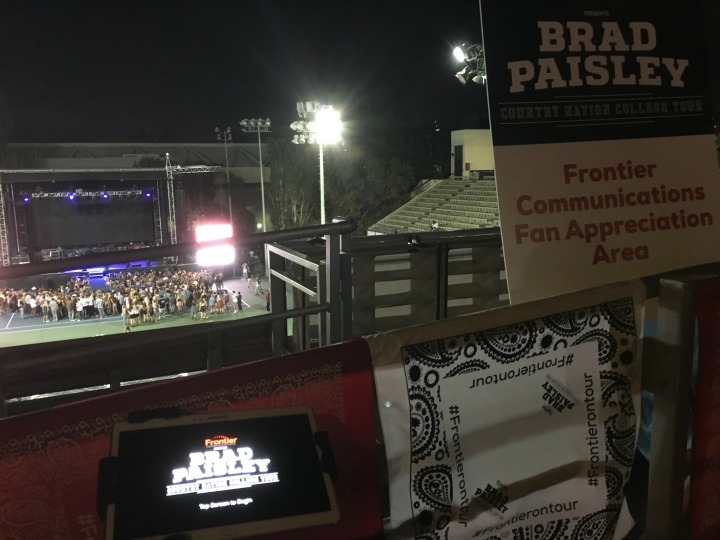 That all changed last Friday night when I was invited to see Brad Paisley perform at UCLA for the Country Nation College Tour presented by Frontier Communications. Frontier Communications acquired Verizon Fios earlier this year. Our family has been a Fios customer for years and we have joined them for many fun events around Los Angeles. When I first found out about the tour I asked one of my very good friends Lindsay if she wanted to join me. Yes, we have the same name and spell it the same way, too! Lindsay is a huge country music fan and has always tried to get me to go to Stagecoach – the Coachella of country music – with her. We were both super excited for a fun girl’s night out (aka GNO). The concert was held on campus at UCLA on the tennis courts. If you’ve never been to UCLA, it is a gorgeous campus that is worth checking out. We walked through the campus and saw a line of several hundred students lined up for the Brad Paisley concert. The college tour was free to students, and UCLA was the last stop of the tour. I could tell how pumped they were. It reminded me of when I was in college and how excited I used to get when really good bands came and played free shows on campus. So many good memories. We checked in at the Frontier Communications booth, got our tickets, and had some appetizers and drinks. Afterwards we headed back over to see what Frontier Communications had going on in the fan appreciation area. There was a bandana making station where you could make your own custom Brad Paisley bandana in white or red. After we got our photo and bandana the show started with opening act, Brett Young. The crowd went nuts for him! Brad Paisley took the stage shortly after. My favorite song he played was one about selfies. During the song he grabbed at student’s phone from the crowd and took a selfie with it. I thought that was pretty hilarious. They also showed a screen of Brad Paisley’s character from when he was on South Park. I had no idea he was a guest on South Park before. I’m going to have to watch that episode. One thing I noticed about country music is that everyone is so happy. There was also fun videos playing on the screen in the background during the songs. There was one popular song Brad played called “Riverbank” and there was a squirrel waterskiing on the big screen. So funny. 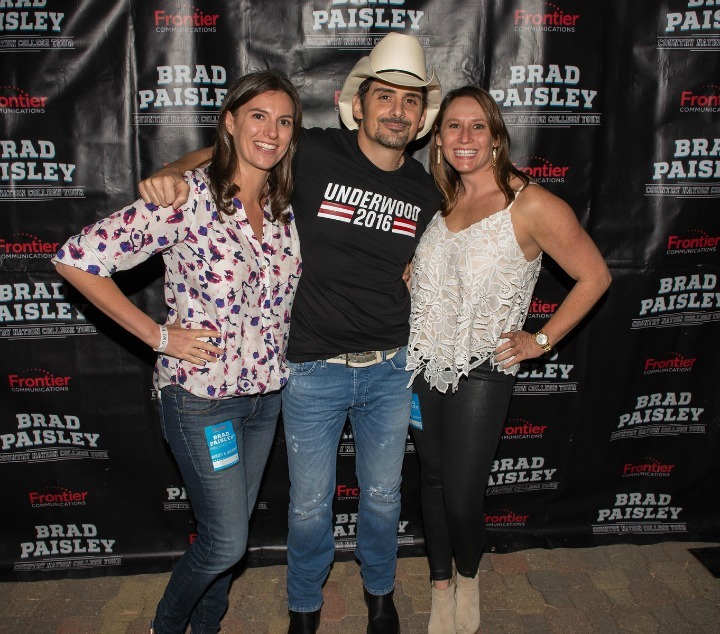 The show was great and afterwards was a highlight for us because we got to meet Brad Paisley! Frontier Communications gave us passes to the Meet & Greet. We stuck our passes on our jeans and went behind the stage to meet Mr. Brad himself. He was wearing a shirt that said “Underwood 2016.” Naturally we asked him if he was referring to “Frank or Carrie.” His reply? 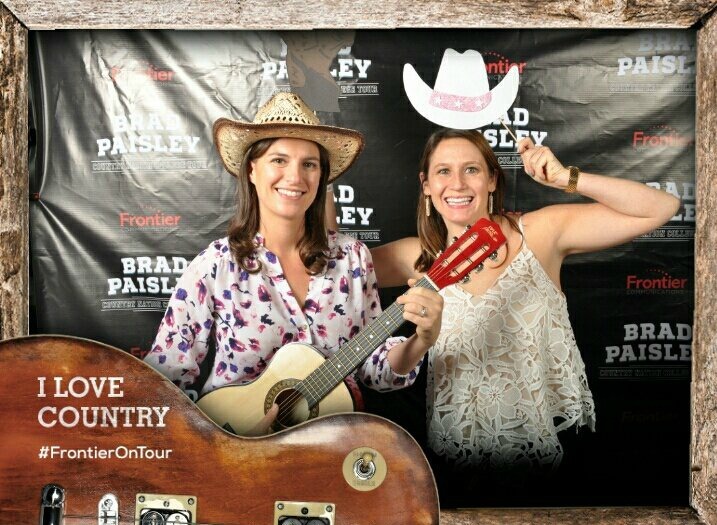 Overall the Brad Paisley concert was such a fun girl’s night out. Many thanks to my husband for staying home with Toddler Awesome and to the folks at Frontier Communications for such a fun and memorable evening!